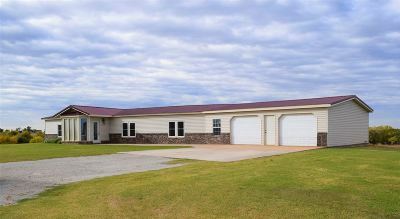 Quiet tranquility with wildlife and a pond is what you will get with this home situated on 7.46 acres. Open concept kitchen, living and dining room with 3 bedrooms, 2 full bathrooms, and a pellet fireplace to warm you when you&apos;re cold. 2 shops along with RV hookups and the framework for an RV port Don&apos;t worry about taking and picking up the kids, this home is on the Chisholm School District bus route.